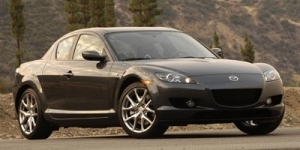 The good: With its high-revving rotary engine and consummate handling, the swoopy 2008 Mazda RX-8 delivers a smooth, well-balanced ride with plenty of poke near the redline. The bad: The RX-8 suffers from lackluster performance at low rpms and lamentable gas mileage. Its cabin electronics are in urgent need of an upgrade. The bottom line: With its distinctive high-revving rotary engine and comic book exterior styling, the Mazda RX-8 differentiates from the competition. Its cabin tech is badly outdated, but that doesn't stop it from being a blast to drive. © 2007 CNET Networks, Inc. All rights reserved. Used by permission.